Three days and two nights in Bokeo Nature Preserve in Northern Laos. Zipline over the forest canopy. Living in a treehouse more than 100ft above the ground. Waking up early to walk around looking and listening for animals. Did I mention ziplining through and above the forest? The Gibbon Experience is just as the name describes, an experience. A feast for the senses. The most extreme version of climbing trees and playing in treehouses, with the power to make any adult feel 10 years old again. Nate and I shared Treehouse #3 with a British couple from London, Lou and Ben. We ate our meals together (some hot, some cold, all involving sticky rice), explored the forest via hiking and ziplining, and cared for our resident cat who we named Frankenstien due to his crossed eyes and half-chopped curly tail. We also kept ourselves entertained when the sun went down by playing cards, searching for and naming the spiders in the roof of our treehouse, drinking our nightly dose of hot ovaltine, and the best of all, climbing out on the zipline to dangle in the dark and see the vast array of stars above. Each morning we were lead by a guide on a hike to look for wildlife in the area: giant squirrels, asiatic black bears, tigers, and of course, the elusive gibbon. Nate spotted one giant squirrel, we saw some colorful birds, and our guide made some cool animal sounds, but that was about the extent of our sightings. And while I think it would have been pretty amazing to see gibbons swinging through the forest, swinging through ourselves on ziplines was breath-taking. In one day we traveled over 5km just on ziplines, and some sections allow you to zip for nearly 400 meters over valleys and see untouched jungle for miles. The second morning there was a thick mist sitting in and above the canopy and zipping through this, then rising out of it to see a blue sky, layers of white clouds, and then tree tops… what an unbelievable sight. The Gibbon Experience was set up to help preserve this beautiful area. The revenue from one year of operation is equal to the money logging would generate in a year – and that can only be done once. The project also protects the area from poachers and is staffed by local Lao people. If you find yourself Laos (which I would highly recommend), you would be missing something incredible by not indulging in this experience, though you should book ahead. We decided we were willing to take the $260 plunge a few days before we wanted to go, and it seemed like no problem. It wasn’t until later that we realized how lucky we were – they had created a new group to take us (and eight other last-minute-bookers) out. The next opening was in mid-January. I want to share a very vivid recent experience I had in Bokeo Nature Reserve, in Laos. It was the last chilly night in Bokeo, we were all nestled in our jackets were drinking hot chocolate in our wooden tree house, 40 meters off the jungle floor. As the sun sank behind the distant mountains, a new set of sounds began to consume our surroundings, quickly becoming pitch black for miles around. This night I was determined to finally see the brightly starred sky we got peeks of through the corners of our treehouse. We only had a zipline that disappeared above the noisy black jungle, so we inched out on the 80 meter steel line above the canopy, with little headlamps and a little intimidation. It’s hard to describe the sensation. To be suspended over 100ft above a howling jungle in total darkness. A sky errupting with more stars than I had ever seen. To be floating between the soundscape and treetops beneath my feet, and a mesmerizing sky; weightless, so small and unprotected. The headlamps were useless once we got too far on the wire, but they were an appreciated comfort. I stayed out a little while longer as the others inched back to the treehouse. All the senses were engaged, fully alert and analyzing, yet almost hypnotized in a dreamlike state by the sensations. My eyes were open, but felt closed. My body dangling nothing within reach, yet all felt so close. It was beautiful. 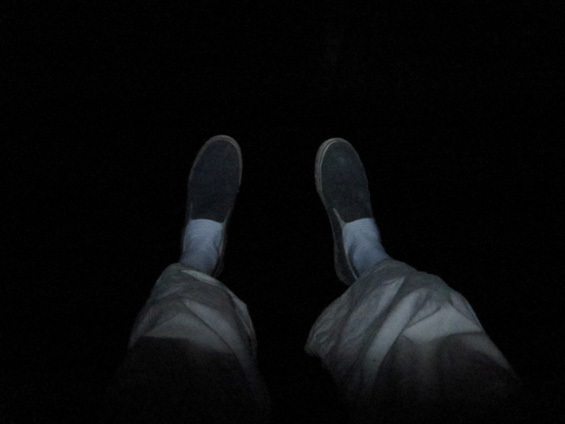 Feet, lit by a headlamp 100ft above the jungle. Plunge into the cold water and repeat.